Unfortunately, we are often judged on our appearance, especially when it comes to first impressions. One of the first areas people often look to formulate a decision about us is our smile. When you have an unattractive smile, it is not uncommon for people to view you differently. Not to mention, if you do not love your smile, you often have low self-esteem. 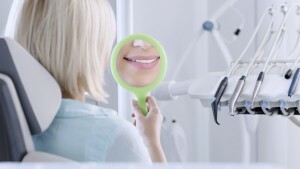 Research shows that half of adults do not like the appearance of their teeth, which is why many have turned to their cosmetic dentist in Indianapolis. Your cosmetic dentist will help you achieve a beautiful new smile with a smile makeover. Your smile plays an important role in your social and career engagements. If you do not like the appearance of your teeth, you are likely to avoid certain situations or not be as outgoing as you could be. A smile makeover will restore your confidence. Using an array of cosmetic procedures, the appearance of the teeth and gums are enhanced. In some cases, the procedures will also benefit your oral functions. Essentially, art and science are combined to create a flawless smile. How Can I Get a Smile Makeover? Teeth Whitening: Reverse years of stains and discoloration with a professional whitening treatment. We offer both in-office and at-home whitening kits to brighten your smile for a more youthful look. Our professional-grade whitening agents deeply penetrate the enamel to resolve tough stains. Tooth-Colored Fillings: In the past, you had no choice but to use dark metal fillings, which create an eye sore in your smile. Now, you can have a filling that matches your enamel color for a seamless repair. The tooth-colored composite material will ensure your smile looks great while repairing tooth decay. Porcelain Veneers: Veneers are thin false fronts that are bonded to the front side of the teeth to hide cosmetic flaws. The minimally invasive procedure gives the teeth a shapelier and proportionate appearance while making them whiter and straighter. Bonding and Contouring: If you have teeth that are chipped or abnormally shaped, you can restore their appearance with bonding or contouring. Bonding involves the use of tooth-colored material to reshape the tooth while contouring removes a small amount of enamel to restore a tooth’s shape. If you are tired of being judged by your smile or not feeling confident, a smile makeover is the answer for you. Indianapolis Family Dentistry will help you love your smile with cosmetic procedures. Begin the journey to a more attractive smile by scheduling your consultation today.